For a smart casual look, wear a grey cotton blazer with blue jeans — these pieces play really well together. 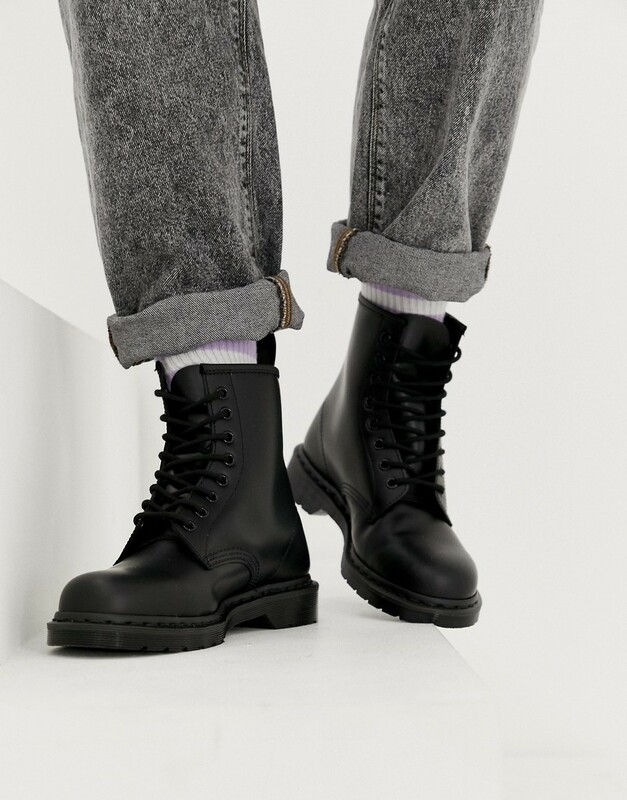 With shoes, choose a pair of Dr. Martens 1460 mono 8 eye boots in black. Marry a burgundy shawl cardigan with navy dress pants to ooze class and sophistication. For something more on the daring side to finish off this look, throw in a pair of Dr. Martens 1460 mono 8 eye boots in black. If you're all about relaxed dressing when it comes to your personal style, you'll love this easy combo of a black shearling jacket and black ripped skinny jeans. Rock a pair of black leather casual boots to take things up a notch. If you're looking for a casual yet stylish ensemble, marry a burgundy bomber jacket with grey skinny jeans. Both garments are totally comfortable and will look great paired together. To add elegance to your getup, finish off with Dr. Martens 1460 mono 8 eye boots in black. 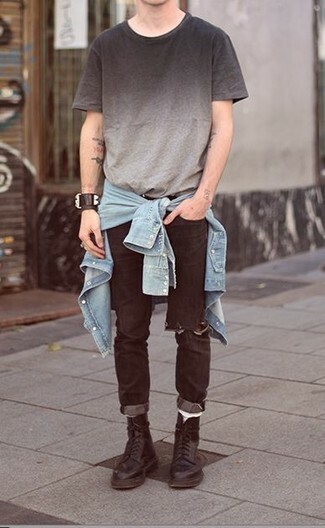 If you're a fan of comfort dressing when it comes to your personal style, you'll love this stylish combination of a light blue denim shirt and black ripped jeans. Channel your inner Ryan Gosling and grab a pair of black leather casual boots to class up your ensemble. If you're searching for a casual yet stylish outfit, pair a white hoodie with charcoal jeans. Both pieces are totally comfortable and will look great paired together. And if you want to instantly up the style ante of your look with one piece, enter black leather casual boots into the equation. 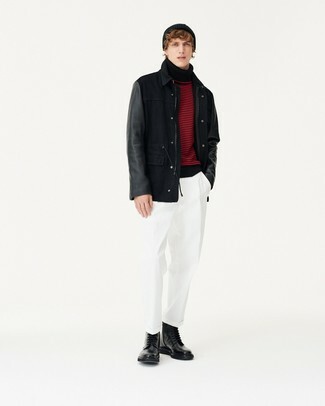 If you're on the hunt for a casual yet on-trend getup, pair a black field jacket with white chinos. Both pieces are totally comfortable and will look great paired together. To add elegance to your getup, round off with Dr. Martens 1460 mono 8 eye boots in black. We all seek comfort when it comes to dressing up, and this combination of a mustard parka and black jeans is a perfect example of that. 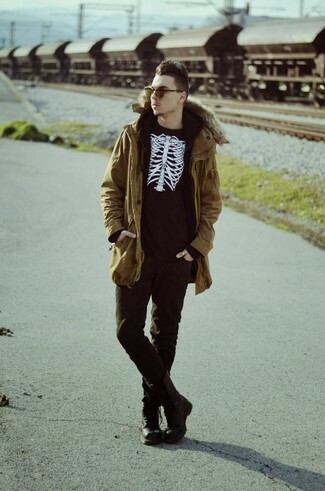 Rocking a pair of Dr. Martens 1460 mono 8 eye boots in black is an easy way to add some flair to your outfit. If you're after a casual yet sharp getup, go for a black leather bomber jacket and navy denim shorts. Both garments are totally comfortable and will look great paired together. Bring instant glamour to your ensemble with Dr. Martens 1460 mono 8 eye boots in black.